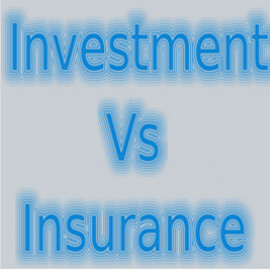 Lots of people gets confused about investment and insurance. This simple mistake create lots of problem in tax planning and long term financial planning. I am going to explain difference between investment and insurance. I am sure this will help you clearing your doubts and take good financial decision ahead. It’s monthly/yearly contribution to achieve ultimate financial goal You need to pay premium to meet financial requirement for family/Nominee/Loved ones when you are not with them. Planning: You should consider how much time duration and money required to meet financial goal Planning: You should consider how much money your family needs in your absence. Every investment has different duration and risk grade associate with investment product. Term Insurance : You pay less premium and get maximum sum assured life coverage as death benefits. But you survive policy duration then you will get nothing. Tax planning: You can consider your investment type with tax planning. you can invest in PPF,ELSS to get investment as well tax planning. Tax planning: You should not consider your insurance need with tax planning at all. Best Investment product : PPF, ELSS,Diversified mutual fund,Gold ETF Best Insurance product : Term insurance and online term insurance policy. You can consider different product like real estate,physical gold,NSC,fixed deposits based on financial condition You should not have different kind of insurance policy like ULIP,Money back policy,Endowment plan and etc.. Try to save maximum and invest maximum so you can get maximum long term return on your investment Pay less insurance premium and get more life insurance sum assured in term insurance policy. You should track your investment on regular basis like yearly or half yearly No worries to track: just pay premium regularly for your term insurance policy. Investing in insurance policy is worst mistake in your life. Example:Paying Rs. 10,000 as premium for Rs. 2 lac sum assured for 10 years and getting Rs. 2-3 lac as maturity is bad planning. 1)If something happens to you then your family will get Rs 2 lac as sum assured + some bonus. -Do you think your family will survive with this amount? 2)If you live 10 years then will Rs. 2-3 lac meet any of your financial goal? Taking term insurance online/offline is great decision in your life. Example: you can get up to 50 lac sum assured by paying annual premium of Rs. 10,000. If something happens to you then your family will get Rs. up to 50 lac as sum assured benefits. I am sure your family can live decent life with this amount for sure. If you survive policy duration then you will get nothing from your term insurance policy but you would have got decent amount from other pure investment for different goals for sure. Have you done investment in Insurance policy? Have you taken term insurance policy for your family?